There are a lot of benefits of living in The Residences at Rodney Square’s apartments in downtown Wilmington, DE: luxury, historic charm and a wealth of modern on-site amenities that make city living comfortable and convenient. Comfort and convenience are also at the heart of Rodney Square’s location, which puts residents just steps from the region’s leading employers, meaning that long commutes can be a thing of the past. The Residences at Rodney Square’s apartments, are situated near dozens of organizations that drive the booming metropolis’s economy, making the community a prime location for employees who work in the area, and those considering careers in the city. Ditch the car and walk the few blocks from Rodney Square to work at any of the large organizations that call downtown Wilmington home. Several banks, employing hundreds of people, are conveniently located nearby. For instance, Bank of America is just a five-minute walk, while JP Morgan Chase and Barclays Bank are both less than one mile away, easily walkable or accessible by several local public-transit lines. Residents can also walk the half-mile or hop one of eight convenient city buses to Christiana Care Health System’s Wilmington Hospital. The corporate headquarters of the health network is a more than 300-bed facility that offers dozens of medical specialties and promising careers for a diverse range of medical professionals. While The Residences at Rodney Square puts residents just steps from their next career opportunity in the city, they can also easily commute to work in the surrounding area. The rental community is minutes away from I-95, the region’s main thoroughfare, which can quickly connect residents to leading employers such as the University of Delaware, which is just a 20-minute drive away, or Accenture, 10 minutes in the other direction. The nearby route 13 can also get employees of Amazon to the region’s fulfillment center in New Castle in less than 20 minutes away. Commuting to work in rush hour traffic, especially around a city, can add a lot of headaches to your day, distracting you from work and taking you away from spending time with loved ones. 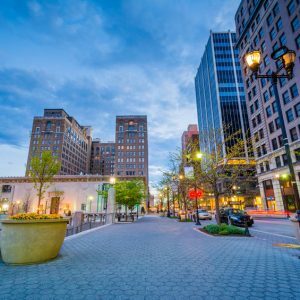 At The Residences at Rodney Square’s apartments in Downtown Wilmington, DE residents can walk, hop a bus, or enjoy quick drives to work, allowing them to give their all to their careers while still having plenty of time in their off-hours for rest and relaxation.